Still the same high-performing Continuous Glucose Monitoring system, now with ShareTM technology (Bluetooth) built into the Receiver! Don’t just meter. Monitor. Only Dexcom CGM keeps you One Step Ahead of diabetes by unveiling dynamic glucose patterns that no meter can. 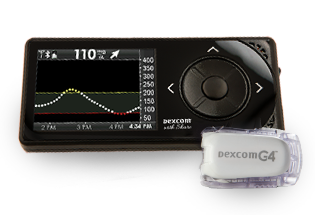 * When it comes to glucose sensing, Dexcom sets the standard. The Dexcom G4 PLATINUM Receiver with Share has Bluetooth wireless communication built in! Through secure wireless connections, the Dexcom G4 PLATINUM Receiver with ShareTM allows remote viewing of glucose levels, trends and data between the person with diabetes and their spouse, grandparent or other loved ones from an Apple iPhone® or iPod touch®. 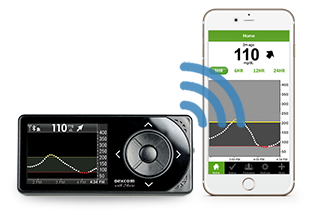 The Dexcom G4® PLATINUM Receiver now features built-in Share technology for remote glucose monitoring. The Dexcom G4 PLATINUM CGM System unveils what no meter can. While meters give a number for a single point in time, CGM provides dynamic glucose information by showing where glucose is, where it’s going, and how fast it’s getting there. 2. Transmitter that is fastened on top of the sensor and sends data wirelessly to the receiver. 3. Receiver that displays your glucose trends in vivid colors so you can easily see when it’s high, low or within range. The Dexcom G4® PLATINUM System with ShareTM was designed to be discreet, comfortable, and lifestyle friendly. A transmission range of up to 20 feet is 3x farther1,2 than the next alternative brand. Various Tones and Melodies designed with you in mind. Choose an alarm in the section below to sample. 2. Medtronic Guardian REAL Time User Guide, 2009.